Comm Eye Health Vol. 19 No. 60 2006 pp 68 -69. Published online 01 December 2006.
International Centre for Eye Health, London School of Hygiene and Tropical Medicine, Keppel Street, London WC1E 7HT, UK. to measure outcome after cataract surgery. Using sound epidemiological methods, these data are used to design and monitor eye care programmes in the surveyed area. RAAB focuses primarily on the prevalence of avoidable blindness, which is blindness due to cataract, refractive errors, trachoma, onchocerciasis, and other corneal scarring. This is because the aim of VISION 2020: The Right to Sight is to eliminate 80 per cent of avoidable blindness by the year 2020. RAAB is rapid, because it only includes the over-50 age group, where the prevalence is highest,4 so that sample size requirements are minimised. RAAB is simple, because it uses straightforward sampling and examination techniques, and data analysis is automatic and does not require a statistician. RAAB is relatively cheap, as it does not take a long time, does not require expensive ophthalmic equipment, and can be carried out by local staff. A RAAB is ideally carried out at the level of a district or province that has a population size of 0.5 to 5 million people. The sample size required for a RAAB is usually between 2,000 and 5,000 people. Clusters of people to include in the survey are randomly selected from across the survey area. Each day, a team visits one population unit (preferably an enumeration area used by the census offi ce, which is a small, clearly demarcated area with a known population, often corresponding to a village or a town suburb). The team randomly chooses a segment of this unit and goes door to door until it has visited 50 people aged over 50 (the cluster). All selected people undergo visual acuity (VA) screening with a tumbling E chart and their lenses are examined. When the VA is lower than 6/18, an ophthalmologist or ophthalmic clinical offi cer determines the main cause. The information collected in the RAAB is used to estimate the prevalence and causes of blindness in the survey area. Data from a RAAB can also be used to assess outcome after cataract surgery, barriers to cataract surgery, and cataract surgical coverage. It is not possible to include all the people in the survey area in your sample, therefore clusters of people need to be selected for the survey. The RAAB software package contains an automated programme to select a list of population units for the survey from the complete list of population units in the area (which is called the sampling frame). Sampling is effected through probability proportionate to size, so that population units with a larger population size have a greater chance of being included than those that are smaller. The quality of surveys depends to a large extent on how well the selection of individuals occurs within clusters. If blind people are more likely (or less likely) to be included, then the prevalence of blindness in the survey will not refl ect the true prevalence in the area. In RAAB, households within clusters are selected through compact segment sampling.6 A map is obtained of the population unit, showing major landmarks and the approximate distribution of neighbourhoods and households (Figure 1). If no map is available, then the village members can create one. The area is then divided into segments, so that each segment includes approximately 50 people aged over 50. For instance, if 300 people aged over 50 live in the area, it will be divided into six segments. One of the segments is chosen at random by drawing lots. The team, accompanied by a village guide, then visits all households in the segment door-to-door, until 50 people aged over 50 are identified. If the segment does not include 50 people aged over 50, another segment is chosen at random and sampling continues. If people are not available when the team arrives at the house, the team should revisit them so that they can be screened. This compact segment sampling is less subject to bias and has therefore replaced the ‘random walk’ method that was used in RACSS. If the person cannot see 6/18 in either eye with available correction, pinhole vision will also be measured. It is difficult to measure vision accurately and one must ensure that the subjects clearly understand what is required of them in the visual acuity test. The lens status of all participants is assessed by both torch and distant direct ophthalmoscopy, by an ophthalmologist or ophthalmic clinical officer in a shaded or dark environment. All eyes that cannot see 6/18 with available correction are examined with a direct ophthalmoscope (and with a portable slit lamp if available) to assess the cause of the visual impairment. Only the primary cause of blindness or visual impairment is recorded. If there are two or more primary disorders, equally contributing to the visual loss, then the WHO convention is to record the cause that is easiest to treat or to prevent. All information is recorded on a standardised form. People who have a vision-impairing cataract are asked why they have not undergone cataract surgery, and up to two responses are marked per person in pre-coded categories. Those who have undergone cataract surgery are asked about the details of their operation (e.g. place, age, type of operation, satisfaction). People with a treatable eye condition should be referred for appropriate treatment. Each team should consist of one ophthalmologist or ophthalmic clinical officer, who can diagnose the eye diseases, and of one assistant who can measure visual acuity. The teams will be accompanied every day by a local village guide. It is useful to have between two and five teams to minimise the duration of fieldwork. All teams should be trained for at least four days, including a field practice where all teams cover one selected cluster. Training should be undertaken by someone experienced in using the RAAB methodology. The survey will usually take between 4 and 12 weeks, depending upon the sample size and the number of teams. The cost of the survey will be largely determined by salaries, allowances, and transport, but is usually between UK £10,000 (US $19,000) and UK £15,000 (US $28,500). barriers to uptake of cataract surgery. All tables report results for men and women separately, as well as together. There is no point in conducting a survey unless the data are going to be used for programme planning or monitoring. A report of the RAAB, including the results, should be written and circulated to stakeholders in the programme. The results from the RAAB should be used to develop a VISION 2020 action plan, to plan the cataract surgical services required, for instance, or to identify problems, such as poor outcomes after surgery or significant barriers to surgery, so that strategies can be developed to overcome these difficulties. RAAB provides the necessary data to plan eye care programmes and also to monitor programmes, if repeated every three to five years. RAAB has been successfully undertaken in Kenya,1 Bangladesh,2 the Philippines, Botswana, Rwanda, Mexico, and China. Since examinations in RAAB are conducted door-to-door, the diagnostic facilities are limited, and it may not always be possible to accurately diagnose causes of posterior segment disease. RAAB only includes people aged over 50, therefore the prevalence of blindness in people aged under 50 cannot be estimated. RAAB measures the prevalence and causes of visual impairment, but it does not assess active trachoma, trichiasis, or infection with onchocerciasis when these are not vision-impairing. If you are interested in conducting a RAAB in your setting, or if you have further queries about conducting a RAAB, please contact Hans Limburg or Hannah Kuper (Email: hannah.kuper@Lshtm.ac.uk). We strongly encourage you to hire experienced professionals to assist in the preparation and training for the RAAB. This will improve the reliability and quality of your survey data. 1 Mathenge W, Kuper H, Limburg H, Polack S et al. 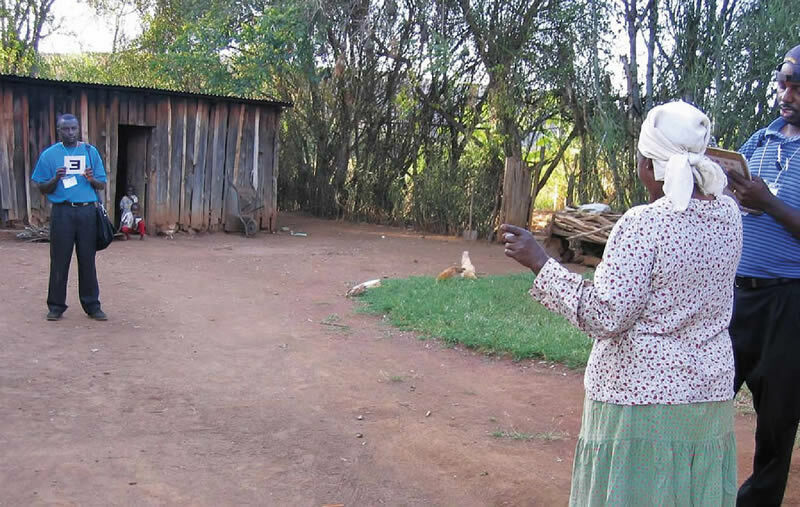 Rapid Assessment of Avoidable Blindness in Nakuru District, Kenya. Ophthalmol. In press. 4 Dineen B, Foster A, Faal H. A rapid methodology to assess the prevalence and causes of blindness and visual impairment. Ophthalmic Epidemiol 2006;13: 1-4.